Finding a skilled, trustworthy dentist and forming a good dentist-patient relationship is essential. Your dentist should be someone who offers the high quality care you need and has undergone advanced training. In addition, your dentist should be willing to listen to your concerns and help you feel at ease. For patients in Fairfax, VA and the surrounding areas, Dr. Riaz Rayek is the dentist who can provide all of these things. Dr. Rayek offers a wide range of dental services to meet his patients’ needs. General dentistry needs, including regular cleanings, examinations, x-rays, oral cancer screenings, and other preventative care, are all available at our office. Unhappy with the appearance of your smile? Dr. Rayek can fix that. He offers cosmetic dentistry options to correct any imperfections and give you a smile you’ll love. For patients who need dental implants, Dr. Rayek is the dentist to see. In the last decade, he has completed more than a thousand hours of advanced training in restorative and implant dentistry. He was also mentored for three years by one of the first implant dentists. Dr. Rayek has devoted a significant amount of time to advancing his knowledge of orthodontics. He is an Elite Premier Provider of Invisalign, meaning he is in the top one percent of Invisalign providers in the nation. An active member of the Dental Organization for Conscious Sedation, Dr. Rayek is qualified to provide patients with safe methods of sedation. Recently, Dr. Rayek has begun advanced training in occlusion dentistry at the Spears Institute of Advanced Dentistry in Scottsdale, AZ. Dr. Rayek believes it is important to consider each patient’s entire health history before making decisions about his or her oral health care. To accomplish this, he created a Customized Oral Wellness program for his practice, which compiles the patient’s records and allows him to create a customized treatment program based on that information. Dr. Rayek places great importance on using the latest and best technology available to provide his patients with the best care possible. The E4D milling machine for fast crown creation and a hard tissue laser for less painful fillings are just two examples of the innovative technology he uses in his office. 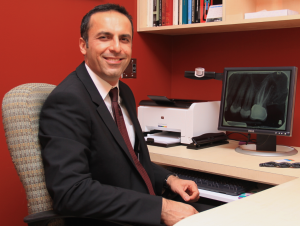 Dr. Rayek makes it a priority to help those who are less fortunate obtain dental health care. He has provided treatment for children who were exposed to radiation in Chernobyl, Russia, as well as young girls from Afghanistan who were part of the first all-girls youth soccer team to travel outside the country. In both of these cases, the children had little to no access to dental care before visiting Dr. Rayek. Selecting a good dentist is one of the most important choices you can make for your overall health. If you are looking for a trusted and reputable dentist in the Fairfax area, schedule your free consultation with Dr. Rayek.